Janice Miller, the matriarch of the family at the center of All We Ever Wanted Was Everything, has spent the last thirty years channelling all her creative talents into her kitchen, her home, and her daughters. A gourmet perfectionist with a major blind spot, she knows how to cook the perfect cherry-Armagnac pavlova, but is willfully unaware that her marriage is on the verge of crumbling, her daughters are failing miserably at their own lives, and that she skates along only on the surface of things. Sometimes, she imagines the life she might have had, had she not accidentally gotten pregnant in college and become the gracious housewife for her ambitious husband Paul: maybe she would have gone to culinary school in France, she thinks. But she doesn’t entertain these alternative scenarios for long – too distracting. On the day that her husband’s company has a meteoric IPO – turning them into millionaires many times over – Janice plans a spectacular feast, with Cornish game hen, duck confit, lemon-ahi crostini and – for dessert – chocolate-lavender pots de creme. It’s a meal that she thinks will mark the day when everything changed for the better. Instead, the change is decidedly for the worse, and the meal goesuneaten. As a not-so-closet gourmet myself, I relate to Janice’s ambitious culinary aspirations. Like her, I will spend endless hours watching cooking shows, or thumbing through food magazines, and tend to subscribe to the philosophy that a meal can be as much an art as it is an expression of love. I first made chocolate pots de creme for my husband on Valentine’s day, as part of a menu that involved salmon en croute and aspragus with lemon-butter – a meal with nearly as many foodie fireworks as Janice’s, but thankfully with a more fortuitous outcome. Pots de creme are actually quite simple to make – essentially, they’re a rich, mousse-y chocolate custard – and this recipe is no exception, with only a few ingredients and a few steps. Note: Food-grade dried lavender flowers can be purchased online or at gourmet food stores. 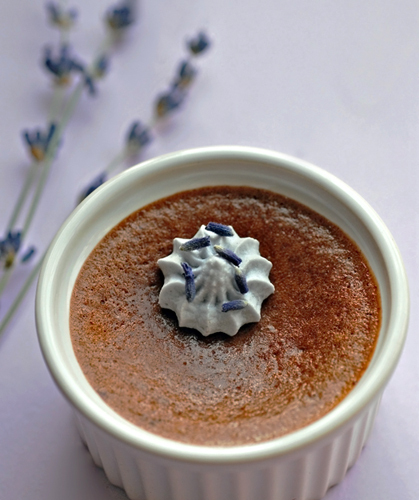 If you can’t locate lavender, just skip the first step of the recipe, and you’ll get perfectly delicious chocolate pots de creme. In a small saucepan gently warm the whipping cream on low heat until it almost reaches a simmer. Remove from heat and add the dried lavender flowers. Set aside until lukewarm, strain out the flowers and discard them. Return cream to the saucepan, cover, and place in the refrigerator to chill and set the flavor, at least 2 hours. Return the saucepan to the stove and gently warm the cream over low heat. Add the chocolate, stirring occasionally until melted. Turn off heat. In a large bowl of an electric mixer, beat the egg yolks with the sugar on medium-high speed until thick and lemon colored. Very slowly, add the warm cream/chocolate mixture to the egg mixture, beating consistently until very well blended.Strain mixture into another bowl. Cool 10 minutes, skimming any foam from surface. Divide custard mixture among 6-8 individual ramekins or custard cups. Cover each with foil. Place cups in large baking pan. Add enough hot water to pan to come halfway up sides of cups. Bake until custards are set but centers still move slightly when gently shaken, between 35 and 50 minutes (cooking time depends on size of ramekin). Top individual custards with a dollop of whipped cream and a sprinkling of dried lavender flowers.